Cecily Brown: Rehearsal is the artist’s first museum show on the West Coast and the first exhibition dedicated to her drawings. Arranged thematically, the more than eighty small drawings, large-scale works, and sketchbooks on view will foreground Brown’s iterative reworking of motifs from her wide-reaching arsenal of source material—prints by eighteenth-century draftsman William Hogarth, pages from animal clip-art books, and the cover of Jimi Hendrix’s 1968 album Electric Ladyland are just some of the images that Brown has rendered again and again in her own hand. These drawings are not studies for her paintings but rather a distinct form of aesthetic inquiry, one that isolates the investigatory impulse that grounds Brown’s art in general. Where Brown’s canvases revel in the visceral immediacy of paint, her drawings offer fragmentary motifs that build upon and undo each other. Their logic productively relates to the concept of ‘rehearsal’—a term derived from the Old French rehercier that originally meant to go over something again with the aim of more fully understanding it. The notion that this repetitive action was geared toward a culminating performance was a later conceit that has obscured the original definition of the word as valuing inquiry in its own right. Indeed, what we witness in Brown’s sketches is the artist’s desire to visualize and respond to the images that attract and confound her (Brown has said that learning to draw is teaching yourself how to see). Painstaking and obsessive in their efforts to work and rework either an entire scene or the slightest of gestures—a turn of a lion’s head here, the arch of a boy’s torso there—Brown’s drawings take the act of looking as their very subject. This exhibition is made possible by support from the James Family Foundation, Nancy and Fred Poses, Jane and Ned Sadaka, and Marlies Verhoeven. Special thanks to Thomas Dane Gallery. 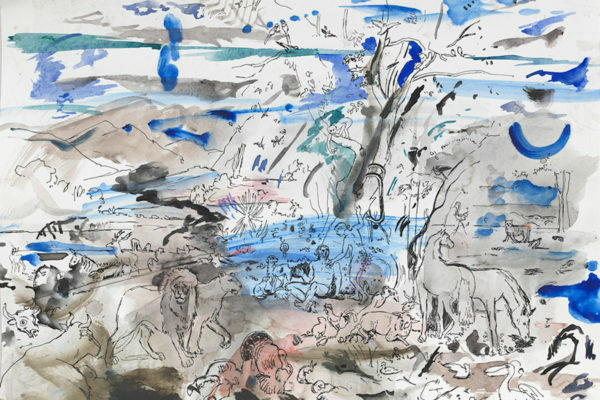 Cecily Brown was born in London in 1969 and studied painting at the Slade School of Art before relocating to New York, where she currently resides. Solo exhibitions of Brown’s work have been mounted by Whitworth Art Gallery, Manchester, UK; Galleria Civica d’Arte Moderna e Contemporanea, Torino, Italy; GEM, Museum of Contemporary Art, Den Haag, The Netherlands; Kestnergesellschaft, Hanover, Germany; Museum of Fine Arts, Boston; Des Moines Art Center, Iowa; Modern Art Oxford, UK; Kunsthalle Mannheim, Germany; Museo Nacional Centro de Arte Reina Sofia, Madrid; Museum of Contemporary Art (MACRO), Rome; and the Hirshhorn Museum and Sculpture Garden, Washington, D.C. She has also been included in group exhibitions at Kunstmuseum Wolfsburg, Germany; Pinchuk Art Centre, Kiev; and Parasol Unit, London. Brown’s work is represented in numerous collections, including the Metropolitan Museum of Art, New York; Morgan Library and Museum, New York; Solomon R. Guggenheim Museum, New York; National Gallery of Art, Washington, D.C.; Hirshhorn Museum and Sculpture Garden, Washington, D.C.; Museum of Contemporary Art, Los Angeles; Rubell Family Collection, Miami; and the Whitney Museum of American Art in New York, where she was included in the 2004 biennial exhibition.